The 1873 two-story frame cottage at 716 W. Maxwell Street, that had been hoisted onto a brick foundation in 1905 by its then owner, was the last mixed-use residence to be vacated on Maxwell Street. Maxworks Co-operative, Maxwood Institute, and Chicago Greens operated out of here, and their members lived here. Before demolition, plastier lathing was removed from the interior of its east exterior wall to reveal balloon frame construction. 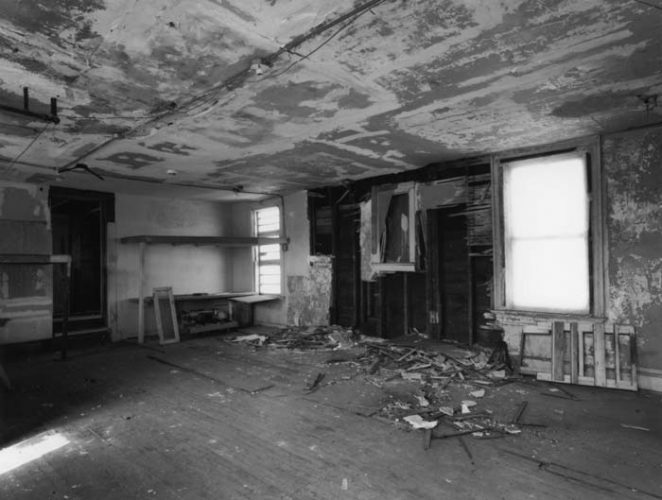 Post demolition, samples of the clapboard siding, balloon frame construction, and 10′ x10′ wooden sill on which the cottage sat were salvaged by members of the Maxwell Street Foundation. All images published by the Maxwell Street Foundation within this website are copyright of the artist and are for educational, personal, and/or noncommercial use only. For any other use, please contact gro.n1555620322oitad1555620322nuoft1555620322eerts1555620322llewx1555620322am@of1555620322ni1555620322.